Day 11 of the 31 day blog challenge is my favorite childhood book. This actually is a series of books, but I loved them all. I think this series developed my love for reading. It turned me on to Sherlock Holmes, and modern mystery novels. What is it? This was a series of books featuring the adventures of Leroy Brown. He was nicknamed Encyclopedia because he was crazy intelligent and knew lots of stuff about lots of stuff. 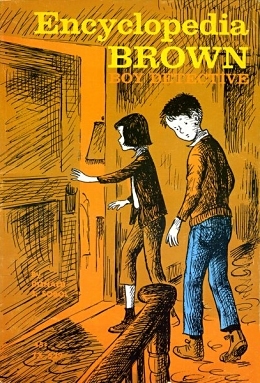 In each book, Encyclopedia Brown would solve various mysteries. I remember being intrigued by his knowledge and ability to always solve the case. Perhaps this book series is why I developed and interest in TV police dramas at a young age (and still love them today). I still love to read, and mysteries are among my favorites. Thanks Encyclopedia Brown for paving the way to a lifelong love of reading!